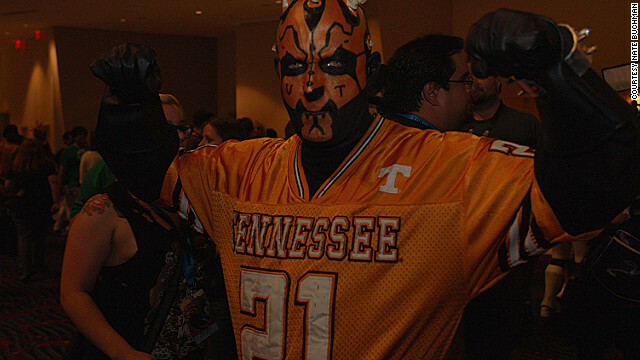 Steve Rifenberick, 47, has merged his love of "Star Wars" and Tennessee football with his Darth Vol costume. For geeks like me, Labor Day weekend is “the most wonderful time of the year” where Whovians, Trekkies, Star Wars fans, LARPers, gamers, Steampunk enthusiasts, aliens, zombies, vampires, fairies, and comic book heroes all mingle in one massive, 5-hotel-spanning nerd diorama. Dragon*Con has started and this is my seventh year attending the Atlanta, Georgia fan festival extraordinaire. As I checked into the Marriott Marquis hotel on Thursday at 12:30 in the afternoon, the air was already electrified. Luggage carts filled to the brim with suitcases and trunks were whizzing about the lobby, each carrying what was surely an amazing costume inspired by science fiction, fantasy, anime, video games or comic book franchises. Later that afternoon, many Dragon*Con attendees could no longer hold back their excitement, and were already parading around the hotels in their costumes. I saw con-goers in guises from G.I. Joe, Star Trek and Doctor Who well before 5:00 PM. While many Americans hit their backyards and gas grills over the long holiday, hundreds of thousands of people pour into downtown Atlanta instead. You see, Dragon*Con is not the only celebration in town. The swarms of college football fans also flood the same hotels, food courts, and restaurants as Dragon*Con attendees for the Chick-Fil-A Kickoff Game (http://www.chick-fil-akickoffgame.com/). And the Thursday night before Labor Day weekend they all arrive at the same time. College football fans aren't the traditional bedfellows with nerdy types, and the costumes of Dragon*Con can seem other-worldly to those not in the know. It's always fun for me to see people check into the Marriott Marquee on Peachtree Street - you can tell by the expression on a person's face if they've been here during Dragon*Con before or if this is their first time and they realize they're not in Kansas anymore. As if fantasy and football weren't enough, Black Gay Pride also draws visitors to Atlanta this weekend, as do the Decatur Book Festival, NASCAR events at the Atlanta Motor Speedway, and the Speakeasy Cocktail Festival, held just a few blocks away from Dragon*Con at the Georgia World Congress Center. “I even go to the [Tennessee] games in this...it's awesome, and they love it up there,” he beams. What helps set Dragon*Con apart from many other pop culture conventions is largely that it’s fan-driven. With the exception of a handful of office staffers, no one involved with Dragon*Con gets paid. The celebrities, TV personalities, NASA astronauts, professors, authors, and musicians who draw big crowds at Dragon*Con panels walk around freely among the fans. It’s a unique aspect of this convention and a rarity in the modern fan convention landscape. First-timer Alaska native Matthew Jarvis, 24, grins at the seemingly endless possibilities for fan camaraderie and celebrity sightings at Dragon*Con. “I have been waiting for this since I bought my ticket in February,” he explains, full of wide-eyed wonderment. He's not the only one. This weekend marks Dragon*Con’s 26th anniversary, and it is shaping up to be the largest one yet. “We had 46,000 attendees last year,” says Dan Carroll, Director of Media Relations for Dragon*Con. “We are estimating over 50,000 attendees this year, based on pre-sales.” And that's not even counting the daily on-site registrations over the four days. “Labor Day is one of the busiest and most exciting weekends of the year in Atlanta, drawing more than 192,000 people in town for Dragon*Con and the Chick-Fil-A Kickoff Games,” William Pate, President & CEO of Atlanta CVB, said. “With record attendance expected for both of these events, we expect an unparalleled level of excitement throughout the city,” Pate said. D*C was an absolute blast, and I can't wait for next year to do it again. This was so MUCH fun!!! I enjoyed myself so much. It was my first time going and as an African American female who LOVES comics, science fiction, ANIME, and fantasy, I was glad to see so much diversity. Going next year as well. If you haven't been, you should go! You will enjoy yourself. Everyone was really nice and we made a lot of new friends. So what actually goes on here? 1st Con and lots of alcohol but no fights everyone was extremely polite and everyone was having a great time the crowds were crazy but still people kept thier sense of humor. Amazing and thanks to all for a great time. Jimbo, I was not a participant but the people watching was superb. And the babe watching was great as well. The booze was flowing and it was great fun. So keep you ignorant remarks to yourself. All of the science fiction conventions are run by fans and volunteers. Dragoncon has certainly become much larger than any other, including worldcon. Sounds like a fun mix of groups that don't often occupy the same space. Wow! I just learned that Dragon Con is held here in Atlanta. They are having fun, unlike you just sitting at your computer making fun of people. HAHA his name is Jimbo......redneck idiot. Stop making fun of smart people!! Now now- the miserable ignorant deserve our pity, not insults.